It is estimated that at least 4 million North Americans each year seek treatment for symptoms of tennis elbow alone, one of the more common locations for chronic tendinitis. Until recently, treatment options for chronic tendinitis have been limited to non-steroidal anti-inflammatory medications (NSAIDS) such as ibuprofen, stretching exercises and avoidance of activities that can cause pain. Occasionally, injections of corticosteroids are performed and, rarely, surgical therapy is attempted – all with the goal of reducing the patient’s pain to enable them to return to the activities and sports they love. But a newer treatment for chronic tendinitis has been developed that may bring greater relief to patients with chronic tendinitis pain. It’s called Radial Shock Wave Therapy. Radial shock wave therapy, or RSWT, is an innovative non-surgical technique developed for the treatment of localized musculoskeletal pain. Since the early 1990s, investigators in Europe have studied the use of shock waves for the treatment of painful musculoskeletal disorders. Initially, treatments were administered with modified kidney stone lithotripters. This was cumbersome, since the devices were not designed for use in the arms and legs. In addition, the very high-energy shock waves produced by these devices caused the patients such pain that administration of an anesthetic was necessary to accomplish the treatment.It soon became apparent that treatment with lower energy shock waves was also effective in the treatment of musculoskeletal pain. These findings led to the development of low-energy RSWT machines designed specifically for use in the arms and legs to treat chronic localized musculoskeletal pain such as that associated with chronic tendonitis. During the olympic games in Sydney and Atlanta the german athletes had the opportunity to be treated with this special therapy. Radial Shock Wave Therapy (RSWT) uses a pneumatic generator to physically deliver the shock wave to the skin, and from there it passes into the body. It is perhaps most analogous to a tiny pneumatic jackhammer striking the skin to create the shock wave. Action Sports clinic uses a Swiss-made low-energy RSWT treatment unit. Patients with painful chronic tendonitis at the elbow (tennis or golfer’s elbow), knee (jumper’s knee), shoulder (rotator cuff), and foot (plantar fasciitis- heel spurs) may benefit from treatment with low-energy RSWT. Results with RSWT are best when patients have had tendonitis pain for at least six months and have failed to respond to other forms of treatment, such as NSAIDS, stretching, and rest. Patients must stop taking NSAIDS and any other medications that inhibit blood clotting and coagulation at least one week before receiving low-energy RSWT. 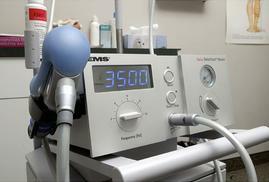 The Dolorclast RSWT unit consists of a control unit, a treatment hand-piece, and an applicator. During treatment with RSWT, the applicator is placed by the Physical Therapist onto the affected area and fine adjustments are made to assure the dose is most comfortable for the patient.To minimize transmission losses in the layer of air between the applicator and the skin, contact gel is used to conduct the acoustic wave. The device administers a preset number of pulses, or shock waves, at a low energy level, allowing for anesthesia-free treatment. Minor pain and discomfort during and immediately after the treatment are the most commonly reported adverse effects. RSWT may cause temporary reddening of the skin at the treatment location, and can also cause minor post-treatment muscle tightness. RSWT has been shown to be a safe and clinically effective treatment option for chronic insertion tendonitis. A recent study of one hundred fifty (150) patients assessed the clinical safety and effectiveness of shock wave therapy, (RSWT) for the treatment of plantar fasciitis. The results were as follows: 56% of patients reported success at 3 months and 94% success at 12 months post-treatment. Multiple published studies have shown that more than half of patients have resolution of symptoms without recurrence after RSWT treatment.